Former UUP deputy leader Lord Kilclooney describes the UUP-Tory pact a "mongrel relationship", while Conor McGinn calls it "an albatross around Cameron's neck". Its been one of those weeks that David Cameron will want to forget. In 2008, Cameron, joined forces with Ulster Unionist leader Sir Reg Empey in announcing that their parties would be forming an alliance, which would see joint candidates standing across Northern Ireland. Cameron hailed their new links as a “dynamic political force”. This week’s events, however, have raised serious questions not just about the future of this political relationship, but more importantly, about Cameron’s judgement, and his ability, if elected to Number 10, to act as an honest, neutral broker in Northern Ireland. And how did Cameron’s political allies in Northern Ireland respond? By voting against the devolution of such powers, in the face not just of David Cameron but also, according to a Northern Ireland Office poll, in the face of their own supporters. Speaking to the Financial Times, Rick Wilford, the Professor of Politics at Queens University, Belfast, clearly says Cameron’s alliance with the UUP was more of a token gesture of “big tent politics” than a serious effort to gain electoral advantage. Indeed, the UUP’s sole MP, Lady Sylvia Hermon, has recently made clear she will not run as a joint Tory/UUP candidate in protest at what she has consistently seen as a bad alliance. So what of the reaction from Conservatives? The chairman of the Northern Ireland select committee at Westminster, Tory MP Patrick Cormack, made clear his view that it looked “odd” and “inconsistent” that the Conservatives and UUP were maintaining their electoral pact, despite disagreeing on what, in many respects, is at the heart of Northern Ireland policy. As the week draws to a close, Cameron has found himself between a rock and a hard place, seeking to be all things to all men, supporting the Hillsborough agreement on the one hand, whilst attempting to strike a more sceptical note to appease his UUP allies on the other. In aligning himself with the UUP so closely, Cameron is now no longer an honest broker, but a participant in Northern Ireland, with political interests to consider, alongside the national interest. And what of Cameron’s election chances? Judging by recent polling data, it is distinctly possible that his new alliance might not return any MPs to Westminster after the election. In such a situation, what authority would he carry in Northern Ireland when the voters have rejected his polices and ideas? 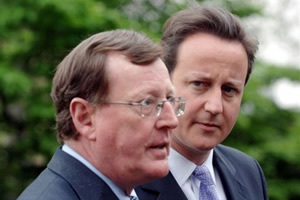 Writing in Progress, Conor McGinn, chair of the Labour Party Irish Society, dubbed the alliance “an albatross around Cameron’s neck”; it remains to be seen whether the albatross fast becomes a noose around the Tory leader’s policies on Northern Ireland. It would also be wrong to let the secret conclave with the UUP and the DUP presided over by Lord Salisbury and Owen Paterson at Hatfield House slip into history. If anything exposes the Tories’ absolute lack of integrity and judgement on Northern Ireland, this gathering does. Who would have thought that the UUP would ‘out do’ the DUP on truculence and unwillingness to progress power sharing….. It is amazing the the political landscape has shifted in NI…..still a long way to go yet…. Sylvia Hermon seems to be the only voice of reason in the UUP as well as being their only MP. It must be tough and lonely for her..